This lecture is part of the Huston Smith Lecture Series on Religion sponsored by the California Institute of Integral Studies, honoring the life and work of Huston Smith, the internationally known authority on world religions. 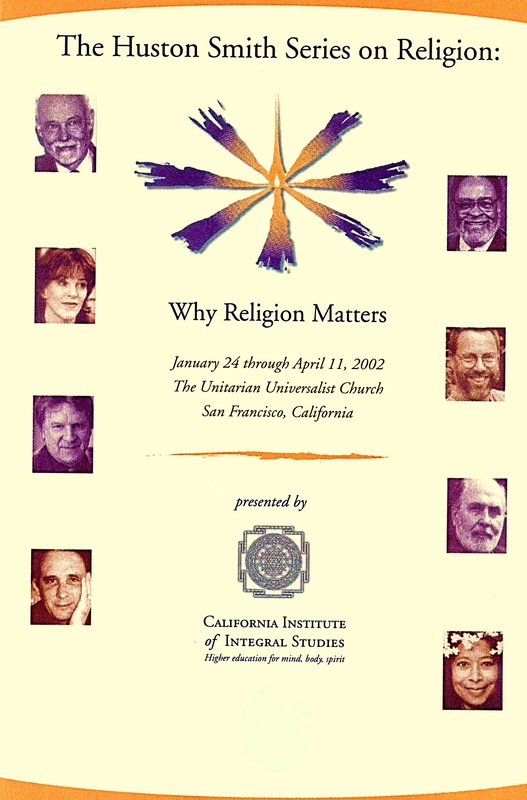 The lecture series was held at the Unitarian Universalist Church in San Francisco, California, from January 24 through April 11, 2002. Marianne Williamson is an internationally acclaimed spiritual author and lecturer. Six of her eleven published books have been New York Times Best Sellers, including four #1 best sellers including A Return to Love, considered a must-read of The New Spirituality. Marianne’s other books include The Law of Divine Compensation, The Age of Miracles, Everyday Grace, A Woman’s Worth, Illuminata, Healing the Soul of America, A Course in Weight Loss, The Gift of Change, A Year of Miracles and, Tears to Triumph: The Spiritual Journey from Suffering to Enlightenment. In 1989, she founded Project Angel Food, a meals-on-wheels program that serves homebound people with AIDS in the Los Angeles area. Marianne also co-founded the Peace Alliance. And she serves on the Board of Directors of the RESULTS organization, working to end the worst ravages of hunger and poverty throughout the world. Williamson, Marianne, "God, The Beloved Partner" (2002). Huston Smith Lecture Series. 3.